RAILTRACK SONGMAPS: ROOSTING POST 1. Railtrack Songmaps Roosting Post 1 is the second part of an ongoing multimedia exploration of relations between people and birds along the railtracks at Tanglin Halt, a historic quarter of urban Singapore undergoing considerable social and environmental change. Guest of Honour: June Yap, Curatorial Director, Singapore Art Museum. The Railtrack Songmaps gang will discuss birdsong and everyday animisms with Cyril Wong and Alfian Sa’at and intangible heritage, urban renewal and contemporary art with Chua Ai Lin, Juria Toramae and Yu-mei Balasingamchow. Tanglin Halt was one of the first public housing development estates in Singapore and runs along part of the former Malaysia railtracks in Southwest Singapore. The railtracks themselves date from the British colonial period and for many decades comprised a major link between Singapore and Malaysia. Singapore’s city centre, enabled human and non-human activities, ranging from the informal to the feral. A Migrant Ecologies Project pathway through this troubled nexus of urbanity and nature explored existing relations between humans and birds along the tracks. Our research, compiled over years of listening to birds and developing conversations with humans, reveals a rich seam of interspecies communications, projections, memories and songs. Together with the Nature Society of Singapore Bird Group we at the same time compiled a list of over 105 species of birds, resonating from what might appear on the surface to be an unremarkable patch of degraded, urban scrub. The stories we have collected are derived from observations and interviews with residents and other “stakeholders”, including NGOs and rail corridor walkers, as well as stories collected during drama and sound workshops in neighbourhood schools. Some stories contradict each other. We have interviewed bird poachers and caged bird lovers, as well as biologists and nature activists. We neither passed judgments nor resolved ostensible contradictions. Rather, our project recounts a vibrant ecology of various perspectives. They morph in and out of each other like shifting shadows of leaves and sunlight, interspersed with the calls of birds. In an interplay of sound, image-storytelling and shadow, the media is led by these bird calls, but the actual birds are never completely in view. There is a gentle play with representative tropes from natural history and competitive bird photography in the approach, which also continues an exploration by the Migrant Ecologies of on-and-offline shadow-worldings and stop-motion film. The tangled heart of Railtrack Songmaps is an immersive sound-rich interactive media installation. The installation has been redesigned since the project launch in 2016, with 32 short films breaking into further fragments of story and song. Each film features one of the songs of 32 of these 105 bird species “in duet” with stories of humans along the railtracks at Tanglin Halt. The cinematography and stop motion in the films evolve from a process, “Avian Web-Re-Wild” which involved the downloading and printing out of online images and video frames of birds from the Nature Society bird count. Lucy Davis and Kee Ya Ting then “re-wilded” these images as OHP transparent puppets in sites along the tracks where the birds were last encountered. The method was entirely dependent on the appearance of sunlight in order for an ephemeral shadow of a bird to be cast on a construction site, desire-path, leaf or tree where the bird was last seen or heard—and a number of the sites had changed beyond recognition since the time of the survey. A related approach involved printing out thousands of frames from online videos, cutting out the birds by hand and re-animating these or, alternately, re-animating the paper frames with empty holes which once featured the absent birds. Roosting Post 1. will also host the launch of what in total will become 32 solar-lit bird book boxes, containing scripts of interviews, photo documentation and “sunshadow photographs”, and a collection of Malay bird pantuns, compiled for the project by Alfian Bin Sa’at. Roosting Post 1. will introduce two new Bird-People portrait-assemblages. Conceived as dedications to our key interviewees, they are part of what in the end will be a series of eight ‘Bird People Portraits’. The Railtrack Songmaps Multimedia Field Notes also feature works by: Aurial Lee, Mary Bernadette Lee, Malvina Tan & Reuben Tan; Laura Miotto and Joseph Nair. 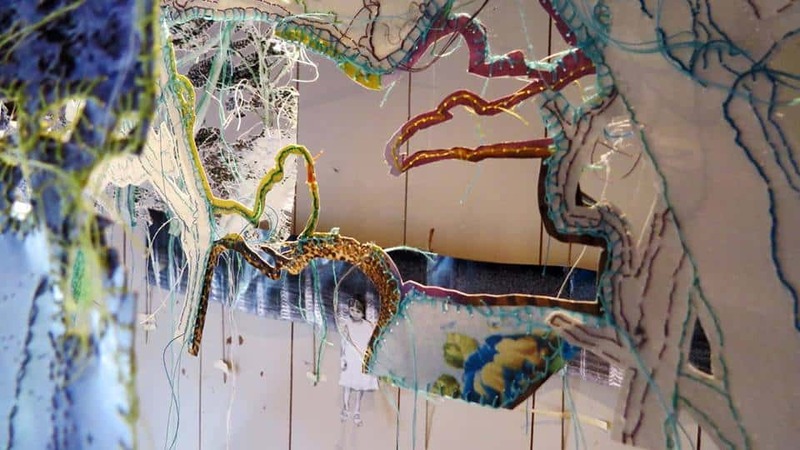 Railtrack Songmaps ROOSTING POST 1. is supported by: The National Arts Council, Queenstown Queensway Zone Residents’ Committee (RC), The Lee Foundation and The Migrant Ecologies Project.